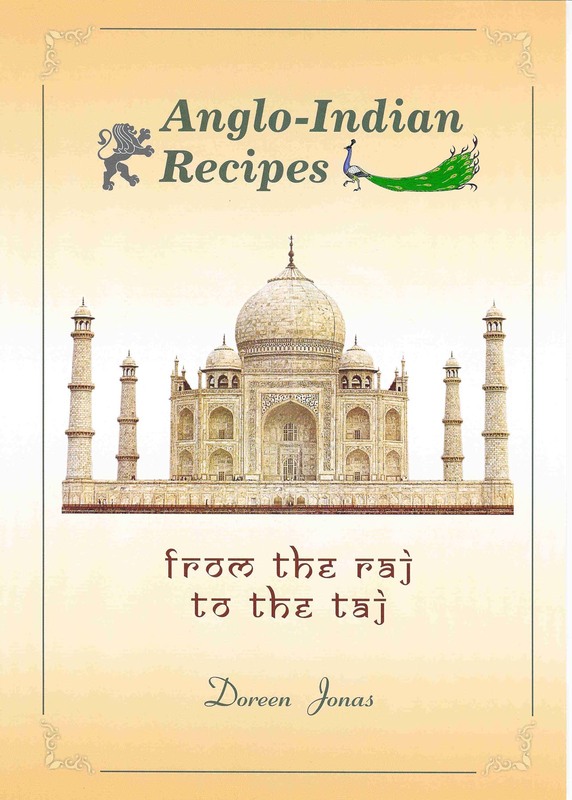 "FROM THE RAJ TO THE TAJ"
When I returned to Bangalore on holiday in 2001, my brother Maxwell asked if I would like to have the notebook in which our Dad had jotted his favourite recipes. I remembered well the little book with its mottled pink cover wherein I too had scribbled as a child. Now, as I held it reverently, almost like a Bible, memories flooded back of my early life. I resolved then that one day I would compile and publish a book of recipes, including some of my Dad's favourites. With this book you now read, I have redeemed my pledge. The Anglo-Indian community was born in India of marriages between indigenous women and European traders and soldiers, from 15th Century Portuguese and subsequently the Dutch, French and British. At its peak, the Community numbered less than half a million - barely registering in the seething population of India. A Christian Community with English as the mother tongue, they were imbued with 'Anglo' traditions, customs and culture. But in one important respect they were completely different: the food they ate and enjoyed was a true reflection of their mixed heritage. To the bland meat, poultry and vegetable diet of their forefathers, they added pungency and flavour with the spices of India. So Anglo-Indian cuisine was born. It is the blend of spices, commonly called ' curry powder ' or 'garam masala ', which gives the food its appetising aroma, enticing colour and exciting flavours. The 'art ' lies in using the right spices in judicious permutations. In compiling this book, my task could be summed up as ''What shall I omit?' I started with Dad's book because I knew first hand that his recipes were the best. Then I was guided by my own family: what did they ask for and enjoy? I also wanted to include regional classics, knowing full well that all 'pukka' Anglo-Indians would look for their own regional favourites. But there is much more to Anglo-Indian cuisine than just exotic curries- and I have included them here: chutneys, festive sweets, drinks to cool the palate and savoury munchies to quell the rumbles. I am grateful to the kind people who shared their treasured recipes and the many friends who gave me their support. Heartfelt thanks to the members of our extended family in India and Australia for their active help and encouragement. Particular thanks are due to Harry Mac Lure who designed the cover of this book. I am pleased to record my very special thanks to dear Maria in Lisbon. It was entirely due to her unstinting practical assistance and expertise that these pages were prepared for printing. Finally, loving thanks to Brian, my patient and tolerant husband who put up with my moods and supplied my meals as I toiled at the PC. Now, at last, my task is done and I feel a sense of relief. If you are new to Anglo-Indian cuisine I hope this book will prove a true and trusty guide and in time becomes a faithful friend. On the other hand, if you are a culinary expert, you will know how to modify a recipe to suit your personal taste. I hope some of your favourites are here with perhaps a subtle variation and maybe even a few happy surprises. Whoever you are, I would be pleased to have your comments...so please do e-mail me by clicking here!